All of our street signs come in one of three varieties: Engineer grade, High Intensity prismatic grade, or Diamond grade reflective sheeting. But what exactly are the differences between these? Engineer Grade Reflective Sheeting typically meets ASTM D4956 Type 1 standards and is an enclosed film or lens using glass beads or prismatic optical technology. 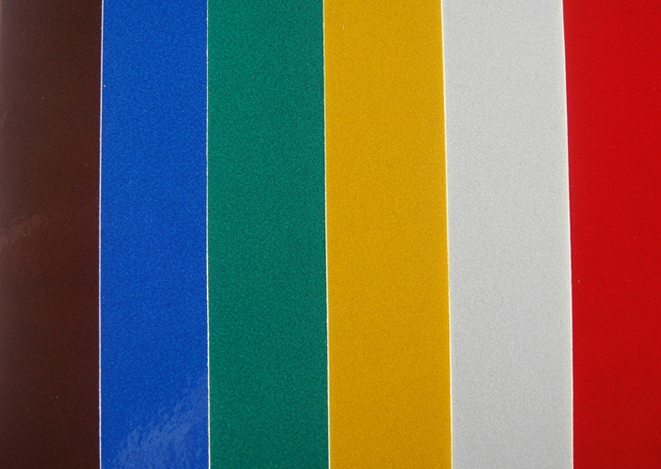 This material is specified for use on non-critical street and road signs such as parking signs or way-finding signs. It has less reflectivity than the other types mentioned in the original question. 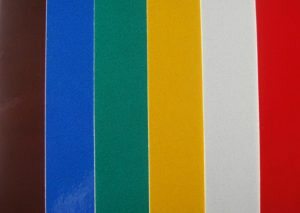 Standard colors are white, yellow, red, blue, green, and brown. 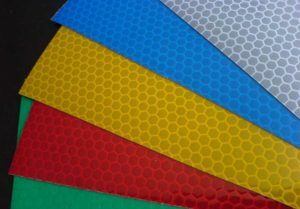 Engineer grade reflective sheeting is also used often for reflective stickers and decals, as it is printable both with digital and screen printing methods. It is also cut-table using a die cutter or a vinyl plotter, which makes it useful for creating reflective decals that are cut to a specified shape. Engineer grade reflective vinyl utilizes and aggressive acrylic adhesive which makes it difficult to remove. Use of heat from a heat gun or hair dryer will aid in the removal of EG reflective sheeting, but often the vinyl will separated from the adhesive, and it becomes necessary to use a glue remover to soften and remove the adhesive. Most EG reflective films have a 5-7 year outdoor durability warranty, and are not considered a “long-term use” material. High Intensity Prismatic (HIP) reflective Sheeting meets ASTM requirement standards for D4956-09 Type III and Type IV, as well as ASTM 4956-07 Type X. It is a non-metallized micro prismatic lens reflective sheeting that is used mainly for reflective traffic and road signs, barricades or other road construction zone devices, and traffic delineators such as cones or barrels. HIP sheeting is highly reflective, and it’s durable topcoat protects signs and other traffic control devices against scratches and abrasion. Not only is it highly reflective at night, it also commands attention during the day as well. 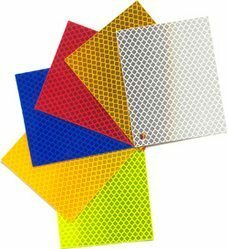 HIP Reflective Sheeting is used for more permanent traffic signs, work zone devices, etc., and comes in white, yellow, red, orange, blue, green, and brown. The manufacturing process for HIP sheeting is also considered to be more “green” as it produces 97% fewer VOC emissions than engineer grade reflective sheeting, and 72% less energy to manufacture. However, the reflectivity value stands alone as a better reason to use HIP. HIP reflective sign materials will last longer than its EG reflective film counterpart. This material is considered to be mid to long-range durability, and typically will last about 10 years. It is likely with pending legislation in the US, that this material will be required to replace many existing signs. Currently all new “critical” traffic control signs (such as Stop signs, speed limit signs, etc.) are required to utilize this sheeting. 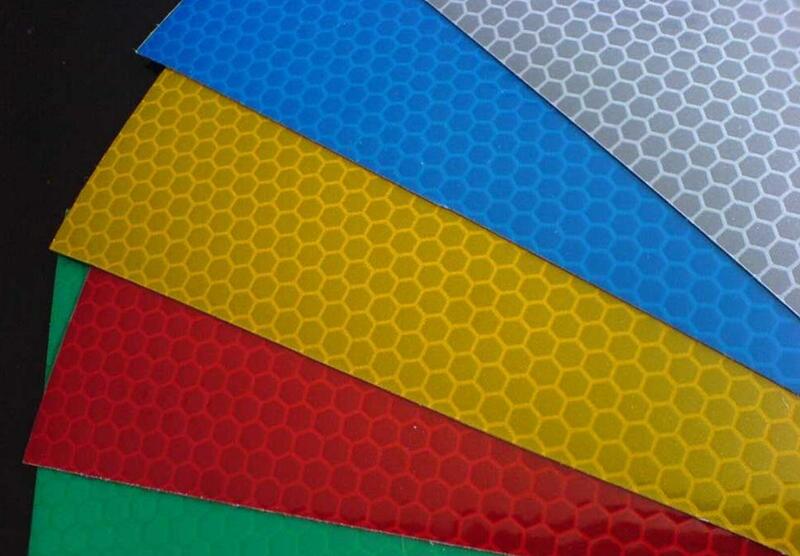 Similar to the other two sheetings aforementioned, diamond grade reflective sheeting has a pressure sensitive adhesive and is applied to (typically) alodized or anodized aluminum sheeting either with a hand roller or a mechanical squeeze roll laminator/applicator. This material can be decorated either using screen printing or by using transparent film that comes in various highway sign colors. DG3 sheeting was engineered to reflect the newer headlights in late-model automobiles, as well as to help older drivers with greater luminescence, as well as truck drivers whose lights are able to pick up signs that utilize DG3 better and at greater distances.